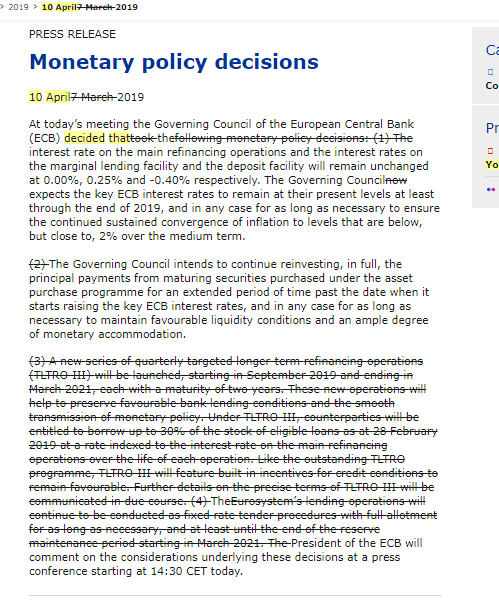 ECB interest rates on the main refinancing operations and the interest rates on the marginal lending facility and the deposit facility will remain unchanged. No reference to last month terms of TLTRO being changed. (Targeted Longer-Term Refinancing Operations) is best described as a long term loan to banks to increase loan creation. The banks lend above a specified benchmark and borrow from the ECB at a negative rate. This will provide an incentive for the banks to lend and thus increase private spending in the economy. That's the theory clearly has not been a great success so far. The President of the ECB will comment on the considerations underlying these decisions at a press conference starting at 14:30 CET today." ECB President Mario Draghi and Vice-President Vítor Constâncio explain the Governing Council's monetary policy decisions and answer questions from journalists at today’s press conference.